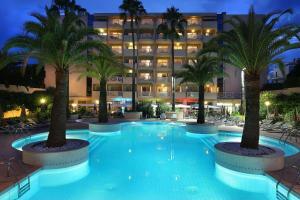 AC Ambassadeur Antibes - Juan Les Pins 5-star hotel offers a private beach, 2 swimming pools and a fitness centre. It is located in the heart of Juan-les-Pins, just 2 km from Antibes town centre. A private balcony with a view and a minibar feature in all of the rooms and suites at AC Hotel Ambassadeur Antibes. Decorated in neutral tones, all have an LCD TV and some have a separate living room. Les Ambassadeurs restaurant is situated on the private beach and serves Mediterranean cuisine, while Le Cezanne and Les Palmiers Grill are located by the outdoor pool and terrace. Cocktails are also served in Le Lautrec bar. Additional facilities include a panoramic lift that serves all of the rooms and a 24-hour reception with a currency exchange service. Parking is possible on site and Nice Cote d’Azur Airport is 20 minutes away. Access to the swimming pool is with an extra cost from 01 July to 31 August. Wi-Fi is available for free in the lobby and with an extra cost in the rest of the hotel.